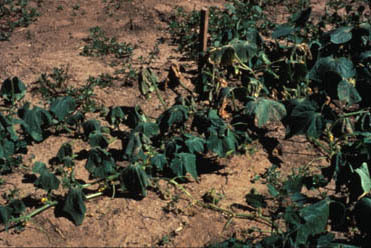 Bacterial wilt is caused by the bacterium Erwinia tracheiphila, which clogs vascular systems of affected plants. It affects mainly cucumbers, squash, and pumpkins. The bacterium overwinters in the “intestines” of cucumber beetles and they transmit the bacterium when feeding on cucurbits. It is often seen in early to mid season cucumbers as the overwintering generation of cucumber beetles carrying the pathogen attack them first. 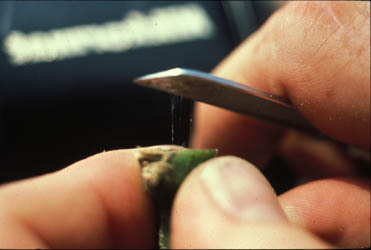 The affected branches wilt first and later on extend to the whole plant. It can lead to serious yield loss (50-100%) both in small gardens and large-scale farm operations. Control cucumber beetles early in the season by spraying with insecticides recommended in your state when the plants are one-week old. Continue treating till two weeks before harvesting (or as recommended on label), remove and destroy wilted plants, and use row covers until pollination time (when male and female flowers are present).